RICHARD G. OLEKSAK and JUDITH A. OLEKSAK vs. CITY OF SPRINGFIELD, THADDEUS PENAS and JANE FLOREK PENAS. The petitioners, Richard G. Oleksak and Judith A. Oleksak, of Westfield, in the County of Hampden, seek in this proceeding to register their title pursuant to the provisions of Chapter 185 of the General Laws to a parcel of land in said Westfield shown on a plan entitled "Plan of Land in Westfield, Massachusetts" (the "Plan"), dated July 26, 1977, by Heritage Surveys, Inc., filed with the Court (Exhibit No. 19). A copy of the plan is attached hereto as Appendix A. An examination of the Plan makes apparent the principal issue in this case, i.e. the location of the boundary line between land of the petitioners and land of the respondents, Thaddeus Penas and Jane Florek Penas, owners of the land adjoining locus on the southeast. Both the line claimed by the petitioners and that claimed by Mr. and Mrs. Penas are shown on the Plan. The land to which the respondents Penases allege that they have title is shown on a plan entitled "Plan of Land in the City of Westfield, Massachusetts, Owned by Estate of Kazimierz Florek", dated May 18, 1972, by Durkee, White, Towne and Chapdelaine (Ex. No. 7), a copy of which is attached hereto as Appendix B. The City of Springfield is the third respondent in the case. The Plan shows what is denominated as a "City of Springfield Water Works Right of Way 100.00' Wide". In fact, as is undisputed, a predecessor in title of the petitioners and the respondents Penases, Joseph M. Smith conveyed to the City of Springfield in fee by deed dated January 11, 1910 and duly recorded in Book 782, Page 222, [Note 1] (abstract [Note 2] s. 11), a strip of land one hundred feet in width, the center line of which was the location of the pipe line. The grantor in the deed reserved a private aqueduct then located across said land and a fifty foot right of way on either side of it. The petitioners and the City should endeavor to agree on the location of the reserved right of way and should furnish to the Land Court Engineers the necessary information so that it may be shown on the decree plan; the petitioners and the City also should agree as to the dimensions of the locus remaining after the fee nature of the City's rights is incorporated into the Plan. The bisecting of the locus will result in the land to be registered being shown as Lots 1 and 2. A trial was held at the Land Court on June 3 and June 4, 1981, at which time a stenographer was appointed to record and transcribe the testimony. All exhibits introduced into evidence are incorporated herein by reference for the purpose of any appeal. said deed to Brach also granted and reserved a right of way ten feet in width, the center line of which was the boundary line here in dispute; title to the Penases property passed from Woronoco Savings Bank to Kazimierz Florek (Mrs. Penas' father) et ux, by deed dated July 31, 1941 and recorded in Book 1719, Page 189 (Exhibit No. 4); a plan entitled "Plan of Land in Westfield, Massachusetts, Belonging to the Woronoco Savings Bank", dated January 9, 1935, by R. P. Boyle (Exhibit No. 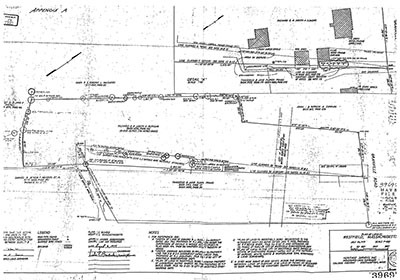 14) is not on record at the Registry of Deeds, but is on file in the office of the City Engineer, where Mr. Boyle was an employee; this plan shows what is now the Penas property and runs the disputed line from an iron pin on Granville Road to a 15" yellow pine at the point where the property then of Ignacy Florek and Samborski met; another plan dated March 30, 1935 by Mr. Boyle (Exhibit No. 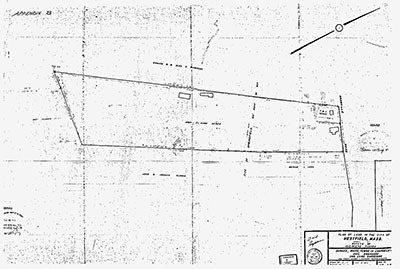 11) shows the Samborski property; the common line between Oleksak and Penas is consistent on both plans and is in accordance with the petitioners' position herein; the petitioners purchased the locus with knowledge of the respondents' claim which would run the line through the garage and shed; a sketch dated July, 1966 by R. J. Jablonski, a witness at the trial, of the Samborski premises (Exhibit No. 6) and a second sketch dated August, 1966 by Mr. Jablonski (Exhibit No. 10) of the alleged line and encroachment show what is now the respondents' position; Mr. Samborski apparently filed the July, 1966 plan for record in Book of Plans 104, Page 126; after the purchase by the petitioners, the respondent, Thaddeus Penas inquired when the garage and shed were to be relocated; he also had a surveyor place pins in the ground connected by string to suggest where he believed the line to be; a plan by the respondents' surveyor entitled "Plan of Land in the City of Westfield, Massachusetts, Owned by the Estate of Kazimierz Florek", dated May 18, 1972 by Durkee, White, Towne and Chapdelaine (Exhibit No. 7) adopts the Jablonski line, but the assessors' plan for the area (attachment to Exhibit No. 2)follows the Boyle drawings which are the earliest in time. I further find and rule that the petitioners' garage was built in its present location no later than 1944; that there is a row of trees beween it and the line claimed by the petitioners; that the shed, which the respondents claim also encroaches, is of a similar age to the garage; that the blazed 15" yellow pine tree shown on the Plan is the same tree shown on the Boyle Plans of 1935 as marking the south­westerly corner of the Penas land; that the line of occupation by the petitioners in the area closest to Granville Road extends southeasterly of the disputed area into land admittedly of Penas; that the conveyance of a lot by Kasimierz Florek to Thaddeus Penas and Jane Florek Penas by deed dated April 30, 1946 and recorded in Book 1825, Page 166 (Exhibit No. 16) runs northeasterly by land of Samborski although a confirmatory deed dated June 16, 1947 and recorded in Book 1880, Page 292 (Exhibit No. 15) gives no abutters. The remainder of the Penas land was conveyed to them by William S. Florek, Sr., et al, administrators by deed dated August 30, 1972 and recorded in Book 3725, Page 17 (Exhibit No. 3). In their answer, the respondents Penases allege that Kasimierz Florek and Walter Samborski had agreed that the encroachments would be removed after Samborski's death. There is no evidence of any written agreement to this effect, and the respondents did not attempt to prove it at the trial. After studying the plans and deeds at length, the Court is of the opinion that the Plan correctly shows the disputed line in the location claimed by the petitioners. The earliest plan in evidence showed the boundary line running from an iron pin on Granville Road to a 15 inch yellow pine tree "marked". An expert witness at the trial testified that he had found a pine tree of that description and of sufficient age which had a blaze typical of a property marker. Using the yellow pine tree as the corner follows that part of the legal description in the deed to Frances Brach which bounds southerly by land of one Florek and then turns and bounds westerly by land of the granter Samborski whereas the construction urged by the respondents would call for a southerly bound by both Florek and Samborski. Granted that the line as claimed by the petitioners leaves the respondents' southerly line substantially short of the deed's call, monuments do control distances. See: Temple v. Benson, 213 Mass. 128 (1912), Stefanick v. Fortona, 222 Mass. 83 (1915), Fulgenitti v. Cariddi, 292 Mass. 321 (1935). Moreover, the lines other than that on the street also fall short of the distances stated in the deed out to Brach. The placement urged on the Court by the respondents would result in a jagged, rather than straight, property line, for the petitioners, and it is unlikely that this is what the parties in 1929 intended. Ryan v. Stavros, 348 Mass. 251 (1964). It would appear to the Court that the error in the respondents' placement of the line may be traced to the Jablonski plans. They show two iron pins or pipes on Granville Road and use that which is more westerly (and which the plan suggests Mr. Jablonski set) as a property marker between what is now Oleksak and what is now Penas. Setting of the pin in such location left a 3.54 foot distance between it and the other pin which Jablonski showed as "found" and from which he ran the line only of the initial Florek to Penas grant. I suggest that the initial Penas parcel bounded on the Samborski land, not on remaining land of Florek and that the corner of the petitioners' and respondents' land is marked by the easterly of the two iron pins which was found, not set as was the other. Even if there were doubt as to the disputed line of record, a strong case for acquisition of title thereto by adverse possession can be made on the facts found by me. However, I view the evidence of occupation as confirmation by the parties of the location of the record line. The placement of the line in the fashion which I have done, however, leads to an encroachment by the respondents' barn on the premises to be registered. Kasimierz Florek, a dairy farmer, kept cows in this barn, and a barbed wire corral was nearby. These activities have been continued since Mr. Florek's death by his son, and the petitioners and their predecessors, so far as appears, have allowed the cows to graze on what is admittedly their land. Accordingly, the respondents are to be allowed to maintain the barn in its present location with reasonable access thereto so long as the present structure remains standing. The parties have not attempted to define the location of the ten foot wide right of way referred to in the Brach deed. Neither party has claimed it in this proceeding, and the shed would appear to block it. On all the evidence, I find and rule that both the petitioners and the respondents have abandoned any right to use the 10' wide right of way. A decree may be entered registering the petitioners' title to so much of the land shown on the Plan as lies without the City of Springfield's 100 foot wide strip, owned in fee, subject to the respondents' right to maintain and repair the barn and to such other matters as appear in the abstract and are not in issue. A death certificate of Edward W. Samborski also must be furnished to the Court. [Note 1] All recording references are to the Hampden County Registry of Deeds. [Note 2] The abstract is Exhibit No. 18.